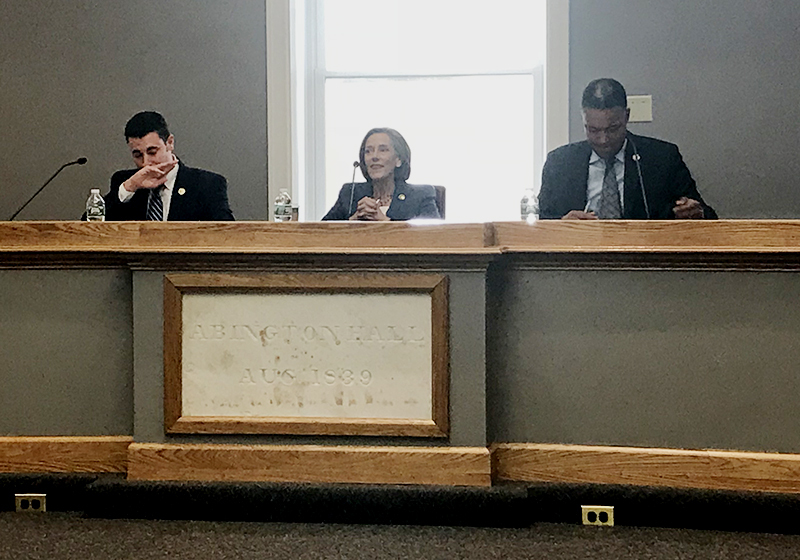 Last night’s the “Conversation with the Commissioners” event at the Abington Township Office not only gave us a good dose of information about county activities, it also revealed the stark contrast between Jenkintown’s government with one committed to transparency above and beyond the strict legal guidelines. First, the concept: Montgomery County is a big place, so having our commissioners set up open forums to meet constituents shows a true commitment to an open process that provides residents with updates and allows them to directly ask questions and make suggestions. Compare that to Jenkintown, a tiny place with twelve representatives who only show up in public at official meetings and the occasional public event to deal with a looming, controversial issue (if even then). Second, the venue: My first time at the Abington offices starkly contrasts with what we experience in Jenkintown. I understand that Abington is a much larger municipality with a larger budget, but seeing their council room fully equipped with working microphones, cameras for live video, comfortable seating, windows(! ), and working ventilation shows a desire by a local government to encourage participation. While I do strongly believe that government must scrutinize every dime that passes through its hands, I also believe that the people should demand government venues as points of pride. Third, the message: We seem to have quite the proactive county government. Chairperson Val Arkoosh proudly cited a litany of programs and activities and at the same time heralded the county’s restored AAA bond rating. Our taxes went up, but they are still the lowest of all the counties in the region, she claims. Whatever you might think of its policies, it does seem that the county expedites them with a level of professionalism and transparency sorely missing in Jenkintown. In other words, the county doesn’t punch above its weight. Setting aside the politics of all this activity or even the necessity of county government in general, the presentation displayed a conspicuous degree of competence and professionalism that Jenkintown residents deserve for our community. Perhaps that new borough hall might some day become a reality, but some of that Cedar Street money might have instead gone to a working AV system, functioning air conditioning, and better gallery seating in Council chambers — anything that invites citizen participation and transparency. Then again, that would have to be a cornerstone of our government’s agenda. View the archived live stream of the event here.